The Giza pyramid complex, also called the Giza Necropolis, is an archaeological site on the Giza Plateau, on the outskirts of Cairo, Egypt. 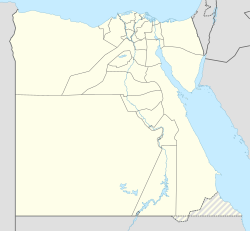 Consisting of a necropolis or mortuary complex of the Fourth Dynasty of the Old Kingdom of Ancient Egypt, it includes the three Great Pyramids (Khufu/Cheops, Khafre/Chephren and Menkaure/Mykerinos), the Great Sphinx, several cemeteries, a workers' village and an industrial complex. 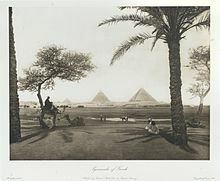 It is located in the Western Desert, approximately 9 km (5 mi) west of the Nile river at the old town of Giza, and about 13 km (8 mi) southwest of Cairo city centre. The pyramids of the complex have historically been common as emblems of ancient Egypt in the Western imagination, were popularised in Hellenistic times, when the Great Pyramid was listed by Antipater of Sidon as one of the Seven Wonders of the World. It is by far the oldest of the ancient Wonders and the only one still in existence. The Pyramids of Giza consist of the Great Pyramid of Giza (also known as the Pyramid of Cheops or Khufu and constructed c. 2580 – c. 2560 BC), the somewhat smaller Pyramid of Khafre (or Chephren) a few hundred meters to the south-west, and the relatively modest-sized Pyramid of Menkaure (or Mykerinos) a few hundred meters farther south-west. The Great Sphinx lies on the east side of the complex. 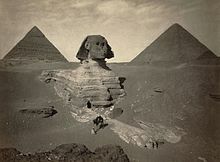 Current consensus among Egyptologists is that the head of the Great Sphinx is that of Khafre. Along with these major monuments are a number of smaller satellite edifices, known as "queens" pyramids, causeways and valley pyramids. Khufu’s pyramid complex consists of a valley temple, now buried beneath the village of Nazlet el-Samman; basalt paving and nummulitic limestone walls have been found but the site has not been excavated. The valley temple was connected to a causeway which was largely destroyed when the village was constructed. The causeway led to the Mortuary Temple of Khufu. From this temple the basalt pavement is the only thing that remains. The mortuary temple was connected to the king's pyramid. The king's pyramid has three smaller queen's pyramids associated with it and five boat pits. :11–19 The boat pits contained a ship, and the 2 pits on the south side of the pyramid still contained intact ships. One of these ships has been restored and is on display. Khufu's pyramid still has a limited collection of casing stones at its base. These casing stones were made of fine white limestone quarried from the nearby range. Khafre's pyramid complex consists of a valley temple, the Sphinx temple, a causeway, a mortuary temple and the king's pyramid. The valley temple yielded several statues of Khafre. Several were found in a well in the floor of the temple by Mariette in 1860. Others were found during successive excavations by Sieglin (1909–10), Junker, Reisner, and Hassan. Khafre's complex contained five boat-pits and a subsidiary pyramid with a serdab. :19–26 Khafre's pyramid appears larger than the adjacent Khufu Pyramid by virtue of its more elevated location, and the steeper angle of inclination of its construction—it is, in fact, smaller in both height and volume. Khafre's pyramid retains a prominent display of casing stones at its apex. Menkaure's pyramid complex consists of a valley temple, a causeway, a mortuary temple, and the king's pyramid. The valley temple once contained several statues of Menkaure. During the 5th dynasty, a smaller ante-temple was added on to the valley temple. The mortuary temple also yielded several statues of Menkaure. The king's pyramid has three subsidiary or queen's pyramids. :26–35 Of the four major monuments, only Menkaure's pyramid is seen today without any of its original polished limestone casing. Most construction theories are based on the idea that the pyramids were built by moving huge stones from a quarry and dragging and lifting them into place. The disagreements center on the method by which the stones were conveyed and placed and how possible the method was. The pyramids of Giza and others are thought to have been constructed to house the remains of the deceased Pharaohs who ruled over Ancient Egypt. A portion of the Pharaoh's spirit called his ka was believed to remain with his corpse. Proper care of the remains was necessary in order for the "former Pharaoh to perform his new duties as king of the dead." It's theorized the pyramid not only served as a tomb for the Pharaoh, but also as a storage pit for various items he would need in the afterlife. "The people of Ancient Egypt believed that death on Earth was the start of a journey to the next world. The embalmed body of the King was entombed underneath or within the pyramid to protect it and allow his transformation and ascension to the afterlife." The sides of all three of the Giza pyramids were astronomically oriented to the north-south and east-west within a small fraction of a degree. Among recent attempts to explain such a clearly deliberate pattern are those of S. Haack, O. Neugebauer, K. Spence, D. Rawlins, K. Pickering, and J. Belmonte. The arrangement of the pyramids is a representation of the Orion constellation according to the disputed Orion correlation theory. The work of quarrying, moving, setting, and sculpting the huge amount of stone used to build the pyramids might have been accomplished by several thousand skilled workers, unskilled laborers and supporting workers. Bakers, carpenters, water carriers, and others were also needed for the project. Along with the methods utilized to construct the pyramids, there is also wide speculation regarding the exact number of workers needed for a building project of this magnitude. When Greek historian Herodotus visited Giza in 450 BC, he was told by Egyptian priests that "the Great Pyramid had taken 400,000 men 20 years to build, working in three-month shifts 100,000 men at a time." Evidence from the tombs indicates that a workforce of 10,000 laborers working in three-month shifts took around 30 years to build a pyramid. "The development of this urban complex must have been quite rapid. All of the construction probably happened in the 35 to 50 years that spanned the reigns of Khafre and Menkaure, builders of the Second and Third Giza Pyramids". "The picture that emerges is that of a planned settlement, some of the world's earliest urban planning, securely dated to the reigns of two Giza pyramid builders: Khafre (2520–2494 BC) and Menkaure (2490–2472 BC)". As the pyramids were constructed, the mastabas for lesser royals were constructed around them. Near the pyramid of Khufu, the main cemetery is G 7000 which lies in the East Field located to the east of the main pyramid and next to the Queen's pyramids. These cemeteries around the pyramids were arranged along streets and avenues. Cemetery G 7000 was one of the earliest and contained tombs of wives, sons and daughters of these 4th dynasty rulers. On the other side of the pyramid in the West Field, the royals sons Wepemnofret and Hemiunu were buried in Cemetery G 1200 and Cemetery G 4000 respectively. These cemeteries were further expanded during the 5th and 6th dynasty. Cemetery G 2100 the 4th and 5th dynasty and later Reisner (1931) G 2100 belongs to Merib, a King's (grand-)Son and G2101 belongs to a 5th dynasty king's daughter. Cemetery G 2300 5th dynasty and 6th dynasty Reisner (1911–13) Includes mastabas of Vizier Senedjemib-Inti and his family. In 1990, tombs belonging to the pyramid workers were discovered alongside the pyramids with an additional burial site found nearby in 2009. Although not mummified, they had been buried in mud-brick tombs with beer and bread to support them in the afterlife. The tombs' proximity to the pyramids and the manner of burial supports the theory that they were paid laborers who took great pride in their work and were not slaves, as was previously thought. Evidence from the tombs indicates that a workforce of 10,000 laborers working in three-month shifts took around 30 years to build a pyramid. Most of the workers appear to have come from poor families. Specialists such as architects, masons, metalworkers and carpenters, were permanently employed by the king to fill positions that required the most skill. ^ Shafer, Byron E.; Dieter Arnold (2005). Temples of Ancient Egypt. I.B. Tauris. pp. 51–52. ISBN 978-1-85043-945-5. ^ Arnold, Dieter; Nigel Strudwick; Helen Strudwick (2002). The encyclopaedia of ancient Egyptian architecture. I.B. Tauris. p. 126. ISBN 978-1-86064-465-8. ^ a b c d e f g h i j k l m n o p q Porter, Bertha and Moss, Rosalind L. B.. Topographical Bibliography of Ancient Egyptian Hieroglyphic Texts, Reliefs, and Paintings. Volume III. Memphis. Part I. Abû Rawâsh to Abûṣîr. 2nd edition, revised and augmented by Jaromír Málek, The Clarendon Press, Oxford 1974. PDF from The Giza Archives, 29,5 MB Retrieved February 10, 2017. ^ "Egypt pyramids". culturefocus.com. Archived from the original on 2 January 2010. ^ "Nature". 16 November 2000. ^ "Nature". 16 August 2001. ^ "DIO The International Journal of Scientific History" (PDF). 13 (1). December 2003: 2–11. ISSN 1041-5440. ^ "Egyptian Pyramids - Lost City of the Pyramid Builders - AERA - Ancient Egypt Research Associates". aeraweb.org. ^ "Dating the Lost City of the Pyramids - Mark Lehner & AERA - Ancient Egypt Research Associates". aeraweb.org. ^ Lehner, Dr. Mark, "The Complete Pyramids", Thames & Hudson, 1997. ISBN 0-500-05084-8. ^ a b Petrie, W. M. Flinders; et al. (1907). Gizeh and Rifeh (PDF). London: School of Archaeology in Egypt. pp. 2–8. Retrieved 4 April 2019. ^ Flentye, Laurel (March 2018). "The Art and Archaeology of the Giza Plateau". doi:10.1093/oxfordhb/9780199935413.013.29. ^ "Who Built the Pyramids?". Explore the pyramids. Retrieved 27 August 2010. ^ Cooney, Kathlyn (2007). "Labour". In Wilkinson, Toby (ed.). The Egyptian World. Routledge. Wikimedia Commons has media related to Giza pyramid complex. The Giza Archives (Gizapyramids.org) Website maintained by the Museum of Fine Arts in Boston. 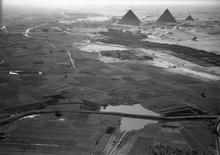 Quote: "This website is a comprehensive resource for research on Giza. It contains photographs and other documentation from the original Harvard University - Boston Museum of Fine Arts Expedition (1904 to 1947), from recent MFA fieldwork, and from other expeditions, museums, and universities around the world. ".